Ultrasound sensors have been used in a variety of applications, especially in the fields of medical science like cardiology, sonography, radiology, and obstetrics & gynaecology, and to a lesser extent in urology and musculoskeletal. These sensors operate at high frequency sound waves. They evaluate the properties of echo pulses and then process it. Medical ultrasounds are used for diagnostic ultrasound, and therapeutic ultrasound sensors. Sometimes conduction system of the heart is not fully detectable by an ECG and requires an ultrasound test. Also ultrasound attenuation spectroscopy is very affective for characterization of particulates. Besides, ultrasonic sensors also have applications in industrial level measurement and vehicle detection. Automobiles with parking support systems use an arrangement of ultrasound anti-collision and vision-based sensors. Ultrasonic sensors are implied to calculate the space, route, or alert about an obstacle leveraging sound waves. Unlike photoelectric sensors, ultrasound sensors remains uninfluenced by an objects color. Doppler shift is a considerable phenomenon defined as the altering frequency of sound wave due to the transducer, in case of ultrasound. Ultrasound sensors are imperative in diagnosis of Tetralogy of Fallot (TOF) in fetus and infants. Globally, development of efficient and advanced technology, rise in the awareness among people, increasing government initiatives across the globe, growing demand for minimal invasive procedures, increasing demand from sonography and renal denervation, and rising prevalence of chronic diseases and injuries pertaining to muscles, joints, tendons, vessels and internal organs are the prime growth drivers in terms of size and value of the ultrasound sensors market. In addition, increase in adoption of ultrasound sensors in emerging economies such as China, India and others, will create new opportunities for the ultrasound sensors share in global market. However, higher cost price of the research and development are the key restraints for the ultrasound sensors market. Geographically, North America dominated the ultrasound sensors market, because of high medical reimbursement facilities, and technological advancement. Asia Pacific is forecasted to have the fastest growth, owing to a rapidly increasing aging population, rise in consumer awareness about ultrasonic treatments, favourable government policies, modernization of healthcare infrastructure, and growing medical tourism industry in developing nations such as China, and India in this region. Among all the products, detection & ranging has the highest market share in the ultrasound sensors market due to higher prevalence of chronic diseases and injuries. This report identifies via acute analysis on the ultrasound sensors market size for the years 2014-2016, and forecast of the same till the year 2022. 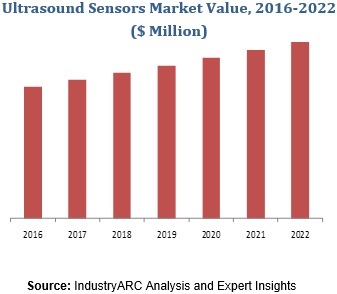 It also highlights the market drivers, restraints, market trends, dynamic value chain, future outlook, growth indicators, challenges, and other key aspects with respect to the ultrasound sensors market.